What is Laurin 100% CocoMCT? Laurin 100% CocoMCT is the concentrated healthiest part of coconut oil. It is a high-quality product that delivers better nutrition, lifestyle and quality of life. It is a light, flavor-free oil that stays naturally liquid, making it suitable as a daily health supplement. CocoMCT is the healthiest part of coconut oil. It is an essential fatty acid that promotes ketone production as an immediate source of energy for the brain and body to work in synergy. Unlike other fatty acids, CocoMCT is not stored as body fat. Rather, it is quickly converted by our liver into ketone energy for our cells. Thus, increasing fat burning and supporting weight loss. What are the benefits of Laurin 100% CocoMCT? What is the difference versus VCO / Regular Coconut Oil? 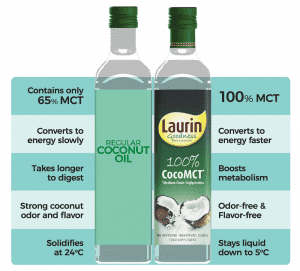 Laurin CocoMCT is 100% MCT oil. It is extracted from coconut oil and contains more MCT than regular coconut oil, including the valuable Lauric Acid, a powerful anti-bacterial and anti-microbial. Nothing is added, only the healthiest portion of the oil is retained. So, you get the concentrated goodness of coconut oil in every bottle of Laurin CocoMCT. How to take it? What is the dosage? Use Laurin as a gourmet oil or as a daily health supplement. Start with 1 teaspoon per day and consume with food. Increase dosage up to 1-3 tablespoons per day. Mix it into hot or cold beverages. Take it directly on its own or with meals. Laurin CocoMCT is a quick source of energy. Best to take in the morning, when you are more active mentally and physically. Another tablespoon can be taken in the afternoon / late afternoon for refuel. Laurin CocoMCT is best to store in room temperature with cap tightly closed. It is not recommended to refrigerate. Yes – for sautéing, baking, garnishing or as gourmet oil. Not intended for deep frying, or high-temperature cooking. Is there an overdose? What are the side effects? Laurin is 100% natural. Overdose will result only to lose bowel movement. Best to take hydrating drinks and banana when this happens. Is it safe for people with medical conditions? Laurin is 100% natural and purely extracted from the best parts of coconut oil. So, if coconut oil is safe for you, Laurin is definitely safe as well. But we still recommend that you seek your physician’s advice.